This week’s set of images come from Andalucia in Southern Spain. Thanks to Nat at Threads & Bobbins for the weekly blog series which includes seven photos summing up your week. 1. Our view for a fortnight. 2. 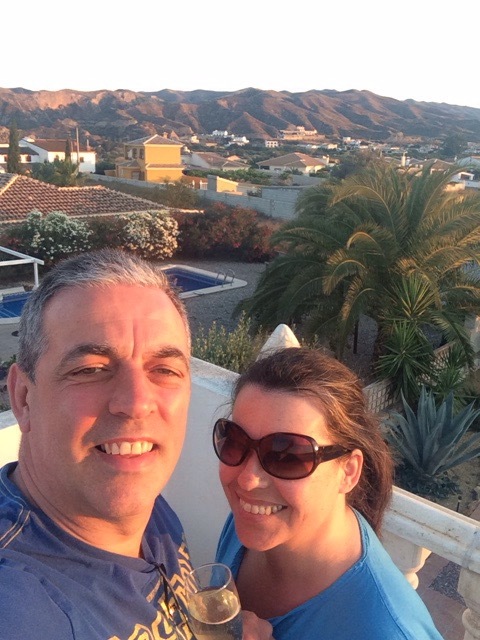 Selfie with Mr. H-L at sunset with the Andalucian mountains as a backdrop – beautiful! 3. 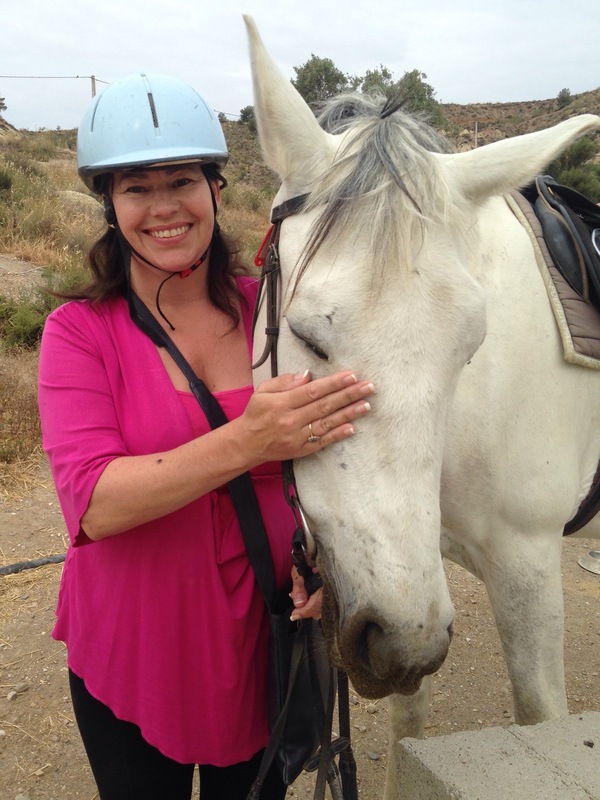 This wonderful mare, Honey, was my mount for an hour as we trekked through the mountain paths. Such a gorgeous horse! 6. Cantering up the last rise and…I fell! 4. Fun in the pool. 5. 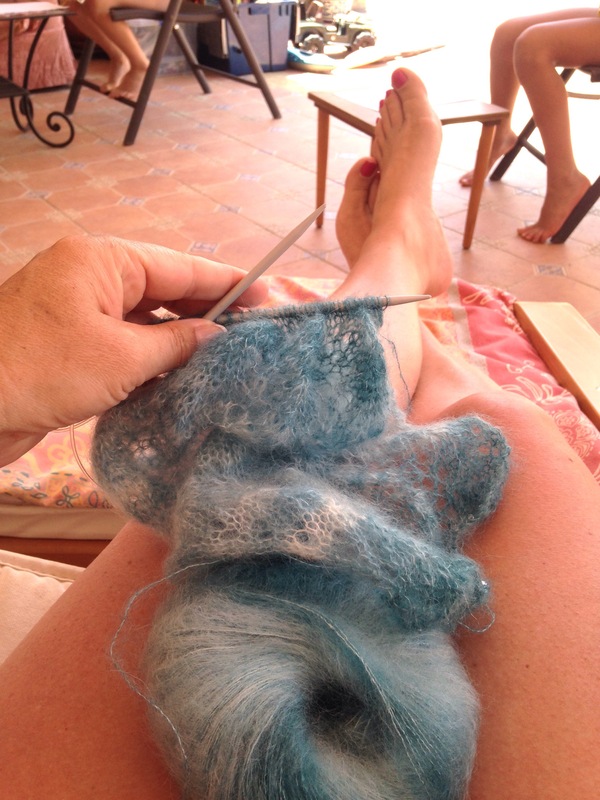 More knitting at siesta time. 6. 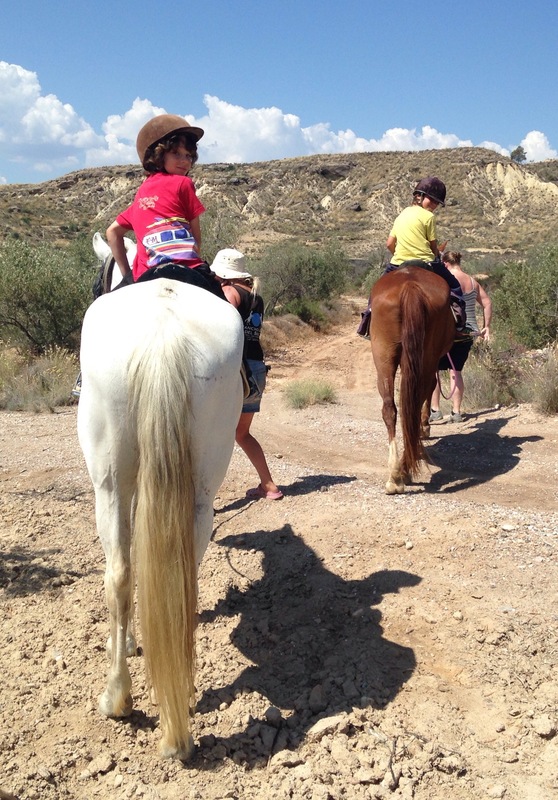 The Boys had their first experience of pony trekking which was, luckily, less ‘eventful’ than mine! 7. 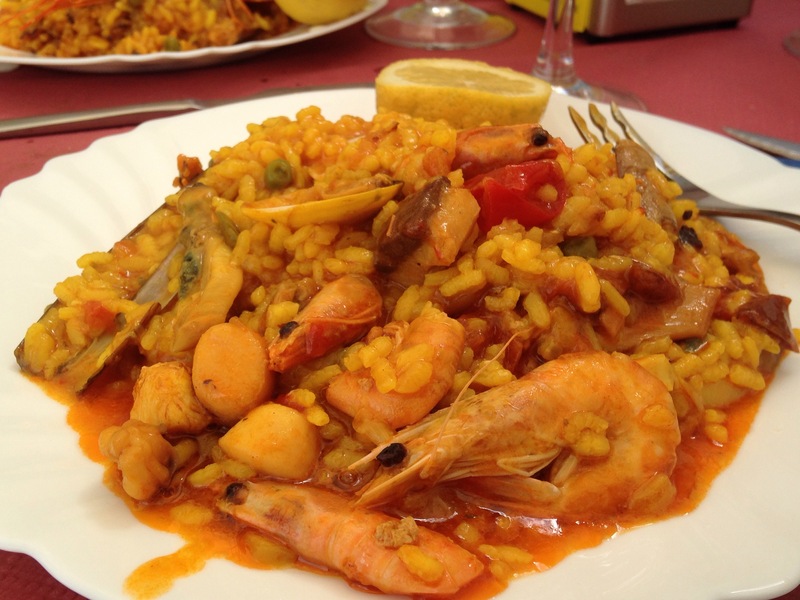 Seafood Paella for lunch today – cooked by Faustino at one of our regular haunts, Bar La Cinta. Yum! 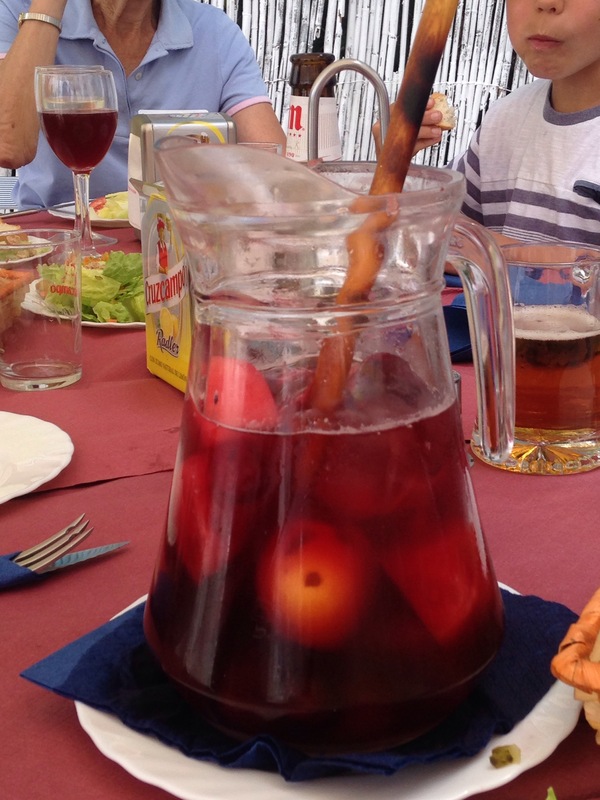 And a jug or two of Sangria to wash it all down! Sunshine, paella and sangria. Too much for me to bear in frozen Yorkshire. What a wonderful time. I’m hoping Summer will have arrived by the time we get back – perhaps we’ll be luckier in Somerset?! It looks like paradise I bet you all wish you could stay much longer, I hope you are okay after the fall?? If you are going to get a bruise…then have a big one! It was last Monday so am recovering well now. Bruises were horrendous but the cracked ribs make laughing, coughing or sneezing an agonizing event! Copious amounts of cava are effective at numbing the pain though, and it hasn’t lessened our enjoyment – how could it? I’m a woman, what can I say – we cope, don’t we? Mr. H-L, on the other hand, takes to his bed if he breaks wind, let alone a bone! 😀 😀 😀 LOL!!! Aren’t all men like that??? I do agree, women just keep on going….no matter what! Ouch! Feel better soon–looks like a lovely, lovely vacation! It’s the perfect place to recuperate, thank you – we’re loving every minute! ooowwww! 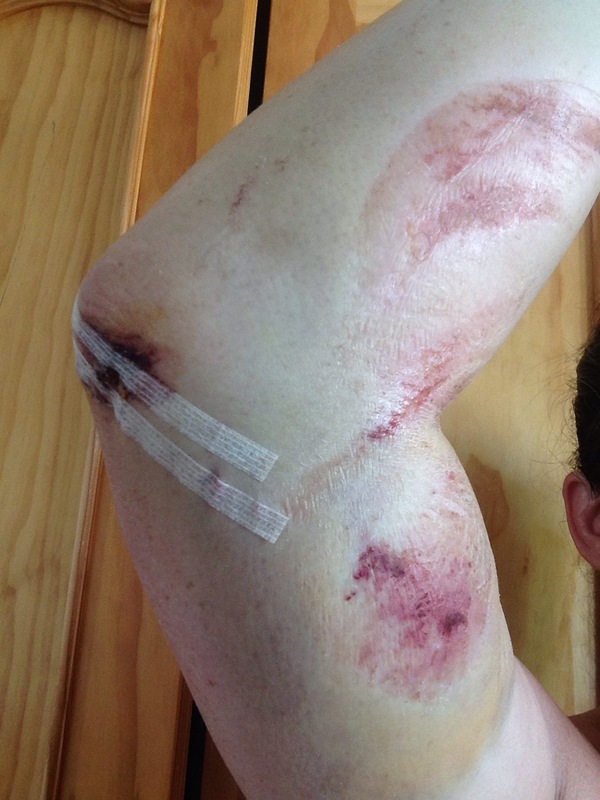 That looks sore…though by judging from your other comments, wine is getting you through the recovery?! Everything looks lovely; the view, the pool & the food! Very jealous of all of your gorgeous holiday pics! – except for your poor arm, ouch! I hope you’re well on the way to recovery now, it looked awful 😦 I love Sangria, and Spain in general! Looks like you’ve definitely made the most of it. Enjoy the rest of your holiday and have your cardigan at the ready when you return! I’m healing quickly, thank you – it must be the sunshine! Please tell me that Summer has reached the UK while we’ve been gone? Erm…right now the sun is out and the sky is blue, but it’s still chilly! Bring some sunshine back with you! A few days left yet but not keen on coming back to rain. I wonder if I can ‘accidentally’ miss the flight…? Your holiday looks wonderful, but I had a huge OUCH moment when i saw your leg! That must’ve really hurt. Ooo, I hope it’s soon better, arm or leg it looks painful. Ahhh I wish I could come on holiday with you! Apart from the nasty fall everything looks gorgeous. Good on your boys for going for a ride after your fall, that would have scared me off! Ouch! I don’t envy the cracked ribs either having cracked one once having a coughing fit, wearing an under wired bra, no joke! I hope your men were running around after you. No such luck with being waited on, unfortunately – if it was the other way round no doubt it would be a different story! Sneezing is the worst – agony! It was my arm but thankfully it is healing nicely now. The ribs are taking longer. There are worse places to recuperate though and we’re having a brilliant time. So true 🙂 it is the perfect place to recuperate. All the best with the ribs, take it easy. Glad you are all having a brilliant time. Enjoy!! It was my arm and it’s on the mend, thank you, although the ribs will take longer to heal. Relaxing in the sun is very healing so we couldn’t be in a better place! Thanks for sharing those wonderful holiday snaps [I do hope you are well and truly on the road to recovery] – hopefully in less than 12 months from now we’ll be in Espana too. 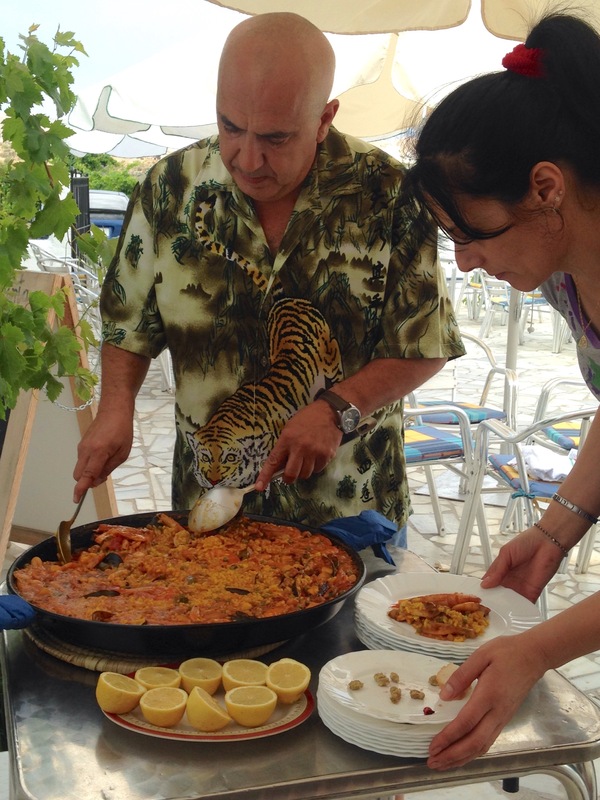 That paella looks wonderful. Hope the leg’s not too painful. Poor you, too, by the sounds of it. Let’s both put our feet up and let the Misters wait on us. As if! Excellent news!!! Sunny here too!!! ☀️☀️ sat outside for my tea! !